Led by General of the Army Wojciech Jaruzelski and the Military Council of National Salvation (Wojskowa Rada Ocalenia Narodowego, WRON) usurped for itself powers reserved for wartime, hence the name. The plan was presented to the government of the Soviet Union before the declaration in March 1981. Poland has not yet perished, so long as we still live! General Jaruzelski had ordered the Polish General Staff to update plans for nationwide martial law on October 22, 1980. After the introduction of martial law, pro-democracy movements such as Solidarity and other smaller organisations were banned, and their leaders, including Lech Wałęsa, jailed overnight. In the morning, thousands of soldiers in military vehicles appeared on the streets of every major city. A curfew was imposed, the national borders sealed, airports closed, and road access to main cities restricted. Telephone lines were disconnected, mail subject to renewed postal censorship, all independent official organizations were criminalized, and classes in schools and universities suspended. During the initial imposition of martial law, several dozen people were killed. Official reports during the crackdown claimed about a dozen fatalities, while a parliamentary commission in the years 1989-1991 arrived at a figure of over 90. In the deadliest incident, nine coal miners were killed by ZOMO paramilitary police during the strike-breaking at the Pacification of Wujek on December 16, 1981. Others were also killed and wounded during a massive second wave of demonstrations on August 31, 1982. The government imposed a six-day work week while the mass media, public services, healthcare services, power stations, coal mines, sea ports, railway stations, and most key factories were placed under military management, with employees having to follow military orders or face a court martial. As part of the crackdown, media and educational institutions underwent "verification", a process that tested each employee's attitude towards the regime and to the Solidarity movement; as a result, thousands of journalists, teachers and professors were banned from their professions. Military courts were established to bypass the normal court system, to imprison those spreading "false information". In an attempt to crush resistance, civilian phone lines were routinely tapped and monitored by government agents. At the invitation of Jaruzelski, a delegation of the ruling Hungarian Socialist Workers' Party visited Poland between December 27 and 29. The Hungarians shared with their Polish colleagues their experiences on crushing the 'counterrevolution' of 1956. Earlier in the autumn of 1981, Polish television had broadcast a special film on the 1956 events in Hungary, showing scenes of rebels hanging security officers etc. The introduction of martial law was enthusiastically supported by some figures on the radical right like Jędrzej Giertych, who believed Solidarity to be a disguised communist movement dominated by Jewish Trotskyites. Even after martial law was lifted, a number of restrictions remained in place for several years that drastically reduced the civil liberties of the citizenry. It also led to severe economic consequences. 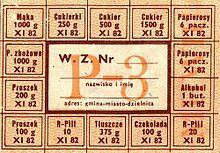 The ruling military dictatorship instituted major price rises (dubbed "economic reforms"), which resulted in a fall in real wages of 20% or more. The resulting economic crisis led to the rationing of most products and materials, including basic foodstuffs. As a consequence of economic hardship and political repression, an exodus of Poles saw 700,000 emigrate to the West between 1981 and 1989. A number of international flights were even hijacked in attempts to flee the country and its economic problems. Between December 1980 and October 1983, 11 Polish flights were hijacked to Berlin Tempelhof Airport alone. Around the same time, a group calling themselves the "Polish Revolutionary Home Army" seized the Polish Embassy in Bern, Switzerland on 6 September 1982, taking several diplomats as hostages. However this turned out to be an apparent provocation by the communist Polish secret services aiming to discredit the Solidarity movement. After the "Wujek" Coal Mine incident in Katowice on December 23, 1981, the United States imposed economic sanctions against the People's Republic of Poland. In 1982 the United States suspended most favored nation trade status until 1987 and vetoed Poland's application for membership in the International Monetary Fund. After the fall of Communism in Poland in 1989, members of a parliamentary commission determined that martial law had been imposed in clear violation of the country's constitution which had authorized the executive to declare martial law only between parliamentary sessions (at other times the decision was to be taken by the Sejm). However, the Sejm had been in session at the time when martial law was instituted. In 1992 the Sejm declared the 1981 imposition of martial law to be unlawful and unconstitutional. The instigators of the martial law, such as Wojciech Jaruzelski, argue that the army crackdown rescued Poland from a possibly disastrous military intervention of the Soviet Union, East Germany, and other Warsaw Pact countries (similar to the earlier interventions in Hungary in 1956 and Czechoslovakia in 1968). Public figures who supported the introduction of martial law (including some of the right-wing figures like Jędrzej Giertych) would also refer to that threat. In 2009, archive documents hinted that in a conversation Jaruzelski had with Viktor Kulikov, a Soviet military leader, Jaruzelski himself begged for Soviet intervention as his domestic control was deteriorating. Jaruzelski responded by claiming the document was 'just another falsification'. Wikimedia Commons has media related to Martial law in Poland. This page was last edited on 21 March 2019, at 11:30 (UTC).